Dynamic Search Ads in AdWords - How to Get Started? Dynamic search ads (DSAs) are an incredible approach to reach the traffic we never could target otherwise. They catch different searches that for which we don’t have ads. These targets can lead a way to explore more opportunities. Dynamic search ads can boost the potential of your search campaigns. We will learn more about DSAs and how to set up DSA campaigns in this blog. Dynamic search ads are keyword-less search ads that Google generates based on the search query and your website’s content. Google uses its organic crawlers to scan your website content for the search terms. Once matches are found, Google creates an appropriate headline based on the search query and ad text based on your most appropriate landing page. Using dynamic search ads, you can promote your new products/services or the existing ones on the go without having to create exhaustive keywords list. 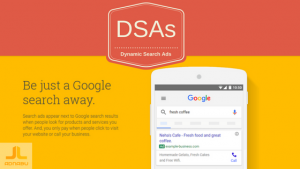 Like every other ad, DSA also enters the auction once Google dynamically generates them. But, if you already have a keyword-based ad eligible for the search query, Google will hold back the DSA. How to enable Dynamic Search Ads? You can set up dynamic search ads by enabling them first at the campaign level. You can create a new campaign and enable dynamic search from additional settings. Once you hit “save and continue,” the prep work is all done. You will be redirected to new page. And now the setup process begins. How to set up Dynamic Search Ads? Once your campaign settings are in place, you need to create an ad group (or ad groups). As we are setting up Dynamic Search Ads, the ad group type (or ad groups) should be dynamic instead of the standard settings. You can name your ad group and proceed further. The next steps are unique and vital. You need to decide which of your pages on your website you want to target. You can either choose specific categories, web pages or your website as a whole. Note: Google automatically generates categories based on your website content. The last step is to create your ads. You have to tailor your ad description as per the content on your website. And when done, save the ad copy. Note: Google creates ad headline and final URL automatically. You can also adjust various settings like bid adjustments (device and ad scheduling), extensions, targeting audiences and implementing negative keywords now. With page feeds, you have extra control over your DSA campaigns. You can ensure that Google shows only products and services that are relevant to shoppers. You have to submit Google a feed of products you want to advertise and select the landing pages which you want to include in auto targets. 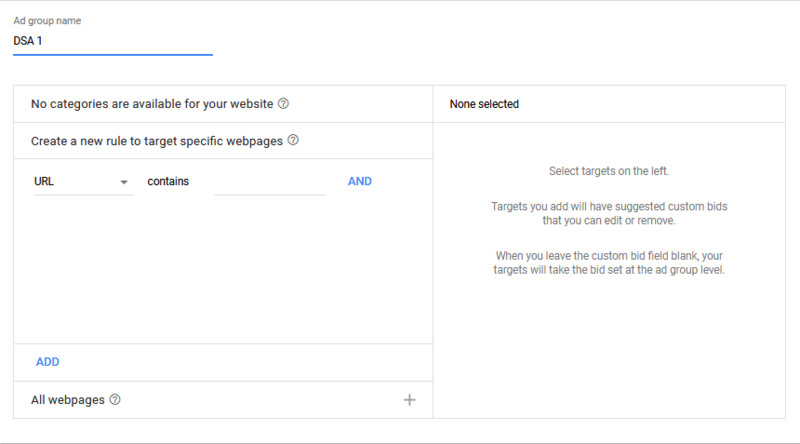 And, you can create dynamic ad targets from your AdWords dashboard page menu on the left. Google uses the information you provide to prepare when to show your ads and to redirect customers to relevant pages on your website. Note: You can also use custom labels on your page feeds to better organize your ads. Similar to Search and Display ads, DSAs also support expanded ads. Hence, you can use the extended description to talk about your products. Dynamic Search Ads can help advertisers stretch their keyword-based campaigns to reach a bigger audience. And with the growth in traffic, better return-on-investment (ROI) can be expected. As the campaign creation is easy, advertisers can target a vast number of queries. Thus, casting a wider net. Note: It is important to understand that DSAs are best fit for websites that are content-rich with an extensive array of products. What are ValueTrack Parameters in AdWords?